SOUTH CENTRAL Preferred (SCP) gives members more choices through access to one of the most comprehensive networks in south central Pennsylvania. As a result of nearly 95% of healthcare providers in Adams, Cumberland, Dauphin, Lebanon, Perry, and York counties participating in our network, we are able to pass along substantial savings through carefully negotiated fees. In addition, we participate with other regional networks and have a national network available for employees living and traveling in other states. Employers benefit from the significant savings that are achieved by carefully negotiated fees from providers and healthcare facilities. Additional savings are also achieved by our low administrative fees. As a result, our rates compare very favorable to other carriers. Benefit plan flexibility - As an ERISA-eligible employer, you can design a benefit plan that meets the needs of your employees. You are not required to follow state mandated health and welfare benefits. Cost based on usage - As a self funded company, you never pay more than your actual expenses. You fund the exact amount of the claims, resulting in improved cash flow for your company. Lower administrative expenses - At most insurance companies, fees for administrative services consume 10- 15% of each premium dollar you pay. 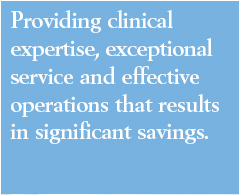 SOUTH CENTRAL Preferred’s low administrative fees result in significant savings. Also, as a selffunded company, you need not pay Pennsylvania insurance premium tax. Paper-free convenience. All physicians, hospitals and ancillary providers in our network send their bills directly to us. For more information about how SOUTH CENTRAL Preferred can help your business succeed, please contact us at (800) 842-1768.